This is Staneybreeks. He stands proud on the belltower of George Cowane's 17th century hospital. When he hears the bells of Hogmanay - so parents tell their credulous children - he dances a wee jig. Any child who stays up late enough on Hogmanay is liable to disprove this story. On confronting their parents, they are told, with devastating adult logic, the obvious truth: auld Staneybreeks has stood under the bells for so long he has gone deaf. We are in Stirling's Old Town. Like Edinburgh, old Stirling consists of a castle on a rock with a medieval town straggling down the slope behind. In many ways Stirling's old town is more historic than Edinburgh's - here is the Earl of Mar's Wark, here is Argyll's lodging, the medieval Kirk of the Holy Rude and Stirling Brig, the strategic river crossing which split Scotland in two. However Edinburgh's Old Town is larger, better preserved and more bustling than Stirling's, which has some jarring modern obtrusions in the streetscape. Yet somehow you are closer to authentic history at Stirling, which retains a small-town and resolutely uncosmopolitan feel. It is dominated by its castle, beseiged innumerable times from pre-history to 1746. During the Wars of Independence it was the last Scottish castle to fall to Edward I (in 1304), and was the last to return to the Scottish liberators, in 1314 - thanks to the battle of Bannockburn. Alexander I and William I died here in the 12th and 13th centuries, and most of the Stuart kings had an intimate relationship with Stirling Castle, the Scottish Windsor. James I made Stirling his base on return from captivity in England in 1424 - he'd been captured at sea - and exacted his revenge on his uncle, the Duke of Albany, who had ruled in his name and made no attempt to have him ransomed or released. James II also contributed to the dramatic history of the castle by his 1452 stabbing to death, in a fit of rage, his over-mighty subject the 8th Earl of Douglas at Stirling. The walls of Stirling are not especially stout: the nature of the rock on which it stands provided much of the defensive requirement, and the buildings inside include a renaissance palace. On our visit it was freezing, the cold slowly accumulating from our toes and fingertips to our core and making itself at home there. We got out of the cold for a while to visit the regimental museum of the Argyll and Sutherland Highlanders, who fought across the globe for the British Empire, then went back out into the cold and into the great hall. The great hall was unheated but, as part of a programme of events, actors playing Victoria and Albert and their entourage were touring the castle in a recreation of Victoria's first visit to Scotland in the 1840s. A band sat in the corner of the hall and played a couple of tunes. A major domo requested that the gathered crowd join in a dance with 'Victoria and Albert', and, with the other tourists, we warmed ourselves up with a waltz and a country dance, cheeks glowing with exercise and delight! The main attraction in the castle, the renaissance palace block, is closed for refurbishment: once it opens this summer the castle will be a must-visit for any Scotophile. It will also be a bit warmer than in winter! Late every May, hundreds of walkers complete the Ultimate Challenge: a sociable walk from the West Highlands to the east coast of Scotland, starting and ending at a number of permitted points. Conceived by Hamish Brown, it is now organised and promoted by The Great Outdoors magazine, and so has now become known, with unavoidable tautology, as the TGO Challenge. Every year, thousands complete the English coast to coast, from St Bees Head to Robin Hood's Bay. An invention of Alf Wainwright, this route is fixed but has no organiser: it is there for you to walk whenever you feel like doing it, and at your own pace. One might think that it would be easy in the Highlands to create a coast to coast route to surpass England's coast to coast. But thanks to geography and Alf Wainwright's cunning, this is harder than it seems. The English coast to coast starts at the beach and headland of St Bees Head: goes through the Lakes, traverses the Pennines, has its only dull section crossing the Vale of York, and finishes with a high-level traverse across the North York Moors and a walk down the cliff-girt North Yorkshire to the beautiful hamlet of Robin Hood's Bay. The Scottish coast to coast routes often start more spectacularly, for example on the ridges of Kintail, the beaches of Arisaig or the roadless coasts and hills round Knoydart, but these walks all peter out into trudges across miles of dull south-eastern Grampian heather moor, with a whole day of road walking to end at places like the working towns of Montrose or Arbroath. The Coast to Coast, it seems, surpasses the TGO Challenge for sustained interest. and arrive in Fort Augustus via the Plodda Falls and Glen Morriston. But after Fort Augustus the route wasn't clear. The Corrieairack pass and its attendant electricity pylons, but then what? There are a number of fine Cairngorm and Mounth passes to choose from, but it is hard to avoid the heathery trudges in the Eastern Grampians. And the route was dog-legged too: barely moving far from the west coast, the route from Gairloch to the Falls of Glomach is a southward excuse to visit lots of good scenery, before reluctantly veering east at the last feasible moment for the rest of the trip. Gairloch to Fort Augustus (or Fort Augustus to Gairloch) would be a very good trip. But it wasn't a coast to coast, it was just a coast. Wainwright was still winning. And then it hit me. Use the lie of the land, don't go against it. Something I'd read - Hamish Brown again I think - about looking down the Lairig Eilde between the Buachailles, about it being 'like a gunsight' as it lined up with another pass across the Blackwater Dam. There are loads of fault lines in the Highlands, the Great Glen being the most obvious. But I'd always been intrigued by the geological patterns in Lorn and Knapdale. I traced my finger back from the Buachaille. It goes down fjord-like Loch Etive, past Loch Nant and its majestic view of Ben Cruachan, through the pre-history rich valley of Kilmartin (with my favourite stone circle, Templewood), past the beaver woods of north Knapdale to the long finger of land that ends at Keilmore and Rubha na Cille. I'd cycled this peninsula one day down to the ancient church at Keilmore. On a mellow September day of radiant soft light it was one of the most haunting, beautifully atmospheric places in the Highlands. 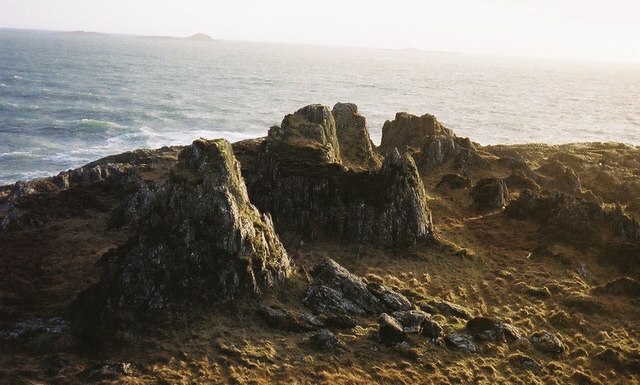 I looked up Rubha na Cille on geograph. The land ended in exclamation marks of stone. I traced my finger forward from the Buachaille down the gunsight of the fault line. Great backcountry across Rannoch Moor: Loch Ghulabain, Binnein Shuas, Glen Markie. And oh! The Findhorn, Scotland's most beautiful river. A place I've not yet visited, yet since reading White River it feels like my duty to do so. My mind was made up: Following this fault line across the Grampians was to be *my* Coast to Coast/TGO Challenge. Now I just need to take the time off work to walk it. Great to be back at work, isn't it? Fortunately there are weekends and holidays to come, and memories to sustain us. Memories like a snowy sunset on Cairngorm. We started at the Coire Cas car park - full of skiers' cars - and took the path along the base of the Northern Corries, a popular and easily accessible winter climbing area. I've tried some easy winter climbs, but you'd have to pay me a lot of money to try some of the climbs in Coire an t-Sneachda! Winter climbing, like motorbike racing, is a sport for those who are more relaxed about dying than the average member of the population. 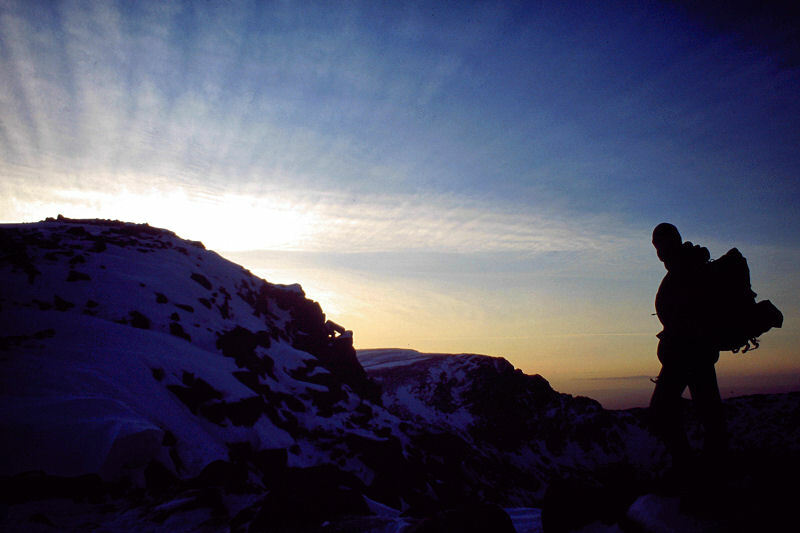 At the far end of the Northern Corries the terrain relents, and it is possible for a walker to ascend to the Cairngorm plateau. This is the easy bit, close to the road: far away across the trench of Loch Avon stretch more remote hills like Beinn Mheadoin, a challenging target in the depths of winter. By now the sun was already low in the sky, and this walk, though short, spends 4km above 4000ft, rarified ground for Scotland. You don't want to be up here after dark in winter unless you are very well prepared. Once down, Miles enthused about a wild bivvy in the forest. It would be fun, he said. It will be brutal, I argued. However I was perversely looking forward to twelve hours uncontrollable shivering in a sleeping bag. Go back to my roots of sleeping wrapped in newspaper and heather in bothies, prove I could still do it, that kind of thing. Hill bagging is a funny game. You slowly work your way through whatever list of hills you are bagging, and whilst reading your guidebook note in advance that some look boring. However, some day in the future, they Must Be Climbed. Why? Because they are on a list somebody made. No other reason. They wouldn't be on your own personal list if you thought in advance they might be boring. As it happens I do have a personal list of walks I fancy doing - I bet you all do - though Meall Tairneachan and Farragon Hill are not on it. 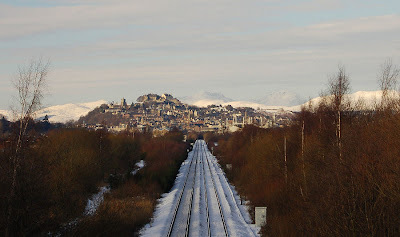 These are two hills that have appealed, because they are easily accessible from the Central Belt and appalled because they look, well, a bit of effort and not especially alluring. But they are on a list someone else made - a fellow called J Rourke Corbett - and so, I suppose, were going to be visited some day. A cold, dull, day where New Year cobwebs needed to be blown off, was as good as any. Hamish Brown has a saying: 'There's no such thing as boring hills: only boring hillwalkers.' The hills are easily accessed by a track for a barytes mine and we saw a mountain hare, buzzard, some red deer and cool icicles. As usually turns out, the hills were enjoyable just for the simple act of getting out and about in the fresh air and wilds. If they hadn't been on a list, perhaps I would have whiled the day away in the house. The company was good too: Graham from the island peaks race had already blown away his cobwebs on the Loony Dook, and Dave had blown his away the day before on Ben Ledi. But in the end, bagging these hills provided a good motivation for him to get out two days in a row. He had attempted them before from Pitlochry - 21km each way over difficult, hummocky terrain - and had had to turn back due to a time limit imposed by train timetables. Bagging is much easier with the option of using a car!